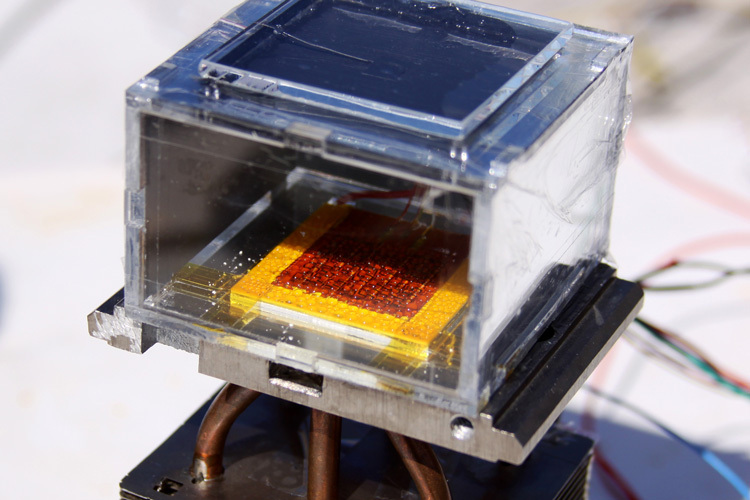 Scientists at MIT and UC Berkeley have developed a revolutionary water harvester that can extract water from desert air by only using the power of the sun. Technologies already exist for extracting water from very moist air, such as “fog harvesting” systems that have been deployed in a number of coastal locations. And there are very expensive ways of removing moisture from drier air such as dehumidifiers that require a large amount of expensive electricity. But this new device is the first that has potential for widespread use in virtually any location, regardless of humidity levels, and without the electric bill. By using a special material called a metal-organic framework, or MOF, this water harvester uses only ambient sunlight to pull liters of water out of the air each day in conditions as low as 20 percent humidity, a level common in arid areas. The revolutionary prototype, under conditions of 20-30 percent humidity, was able to pull 2.8 liters (3 quarts) of water from the air over a 12-hour period, using one kilogram (2.2 pounds) of MOF. Rooftop tests at MIT confirmed that the device works in real-world conditions. MOFs combine metals like magnesium or aluminum with organic molecules in a tinker-toy arrangement to create rigid, porous structures ideal for storing gases and liquids. Since then, more than 20,000 different MOFs have been created by researchers worldwide. Some hold chemicals such as hydrogen or methane: the chemical company BASF is testing one of Yaghi’s MOFs in natural gas-fueled trucks since MOF-filled tanks hold three times the methane that can be pumped under pressure into an empty tank. In 2014, Yaghi and his UC Berkeley team synthesized an MOF – a combination of zirconium metal and adipic acid – that binds water vapor, and he suggested to Evelyn Wang, a mechanical engineer at MIT, that they join forces to turn the MOF into a water-collecting system. While these initial experiments have proved that the concept can work, the team says there is more work to be done in refining the design and searching for even more effective varieties of MOFs. The present version can collect water up to about 25 percent of its own weight, but with further tuning, they think that proportion could be at least doubled.